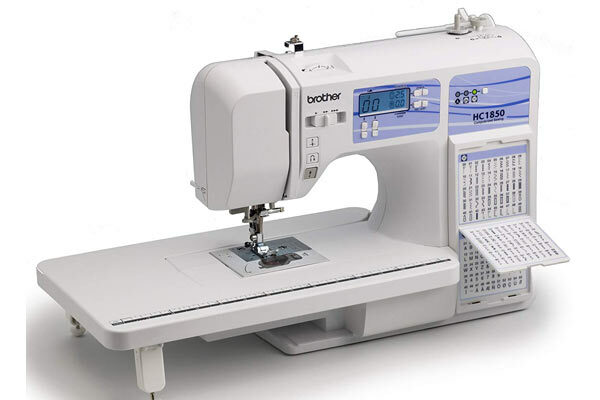 Sewing with Brother HC1850 sewing machine will help you bring your fabric creations to life. Who doesn’t want to sew holiday creations or even clothing sometimes? It will get you through not only holiday sewing but everyday sewing for several years. You can even put a basic monogrammed signature on your creations with this computerized model. It has several great stitches for constructive sewing as well as machine quilting options. Go to town on baby items, quilts, potholders, clothing and décor items with the Brother HC1850. This machine has every stitch you need for basic items, plus a small amount of monogramming. 1.1 Who is the HC1850 for? 1.3 What’s in the box? The HC1850 is a computerized sewing machine and features horizontal top thread holders and 130 stitch options plus 55 alphanumeric stitches. Included in the stitch types are eight one-stitch button holes for your convenience. The basic stitches cover various levels of straight, zigzag, and curved stitches. There are 122 of these, so it covers a lot of sewing! Included with the factory model are eight pressure feet. The feet included are: a buttonhole foot, an overcasting foot, a monogramming foot, a zipper foot, a zigzag foot, a blind stitch foot, a button fitting foot, and a spring action quilting foot. There are other foot models available if you need more. For example – an extra quilting foot. The foot pressure does not have a manual relay, so if you have larger quilting or thicker fabric you may want to get a special foot for it. The needle threader is automatic which is pretty handy once you get the hang of it. However you may need practice with this type of threader if you are just getting started. The Brother HC1850 is very light and weighs just 13.2 pounds. It can be nice to have really light machines if you need to carry it to your sewing classes or if you don’t have a dedicated sewing place and you need to move it often. However, this incredibly lightness needs some tradeoff and while it’s fairly good quality, it is not industrial strength sturdy. You will find a paper manual and an instructional DVD in the box, both in English and Spanish. The maximum stitches per minute is 850, which is very fast. You can adjust the speed on this machine, and the maximum stitch length is five millimeters while the width is seven millimeters. Who is the HC1850 for? Brother HC1850 computerized sewing machine is perfect for beginners and intermediate sewers. It will perform well for several years under consistent use, but it doesn’t have added capabilities of advanced machines like pivot movement or built-in quilting stitches. This makes it great for consistent domestic sewing, but it wouldn’t have enough stitches for an industrial strength sewing schedule. The HC1850 doesn’t have the manual adjustments of older sewing machines, so some things like foot pressure and buttonholes are automatic. While this is great for some people just starting out, people used to the heavy manual customization of older machines may be slightly confused by the automatic settings of this machine. Our advice: use the DVD instruction manual as you learn to use it. It could take a few hours to figure out all the bells and whistles, but it is worth it for ease of use. You also don’t have to worry about fine tuning it often, since there is not too much variation on it. Although it’s not an embroidery machine, it does make basic monogram letters. So, you wouldn’t want to buy this expecting it to take computerized or original embroidery patterns. It doesn’t have a pivot mechanism or multi-directional capability, so it would be pretty tough to do embroidery shapes and heavy quilting on it. You can always do light embroidery with straight stitch, but there is not too much to do on this machine embroidery-wise beyond that. You can’t change the font on the embroidery letters and numbers, so be sure that if you need that capability that you get another machine with embroidery functions. While this may be a drawback for some people, the more affordable price means that there is not too much memory, so sewers just have one font. With many automatic settings and just a few basic quilting capabilities, this machine doesn’t have much to break. One person noted that it cracked fairly easily when it fell off the table, so make sure you don’t put too much pressure on it when it comes to leaning and stacking. One of the drawbacks to lightweight manufacturing is a less sturdy machine, in some areas. Also, all machines that contain computer chips are prone to breaking if dropped or turned over. So, it may need a little more care than the heavy industrial home machines of yesteryear. This machine also should not get wet due to the electronic computer chip. HC1850 has a wide table, perfect for full garments, curtains and window treatments and quilts. You will find that the curved header on the machine easily stores quilt rolls and lets the fabric slide right through without getting caught in a bunch. This is perfect for larger items and hems, such as sofa covers or upholstery skirting. For the traditional larger hems, there is a blind hem stitch. The Brother HC1850 machine may need extra parts if you want to quilt heavier fabric or sew denim, as the foot pressure is not adjustable. However, other than buying a few extra parts you really don’t need much to start sewing. Many people noted how simple it was to use, and once you get the hang of the automatic threader it should save you lots of time. The box contains an accessory pouch with a needle set, a twin needle, a ballpoint needle, four bobbins, an extra spool pin, a seam ripper, a cleaning brush, a screwdriver, a power cord, an instructional DVD, and the paper manual. There is a 25 year limited warranty on the machine, and support from Brother. You can also follow Brother on Instagram at #BrotherSews to see the Brother sewing machines in action or share your photos. Drawbacks to this machine are potentially its lightness and the lack of foot pressure adjustment, but these are not necessarily drawbacks for everyone. However, some people prefer heavier machines. If this is you, this may not be your choice of machine as it only weighs 13.2 pounds. Of course, it is easier to carry and you are less likely to drop a lighter machine, so the negative balances out here for a lot of people. This machine is sensitive to being dropped or turned over, given its lightness and the computer chip inside of it. This is a fabulous computerized sewing machine that lasts several years, just right when you are ready to update. The computerized Brother HC1850 sewing machine does not take a USB or have added fonts for the embroidery. There is no multi-directional sewing capability and no pivot function, so it may be harder to sew multi-curved designs with this model. There is no automatic height adjustment or built-in quilting stitches, so while it may do some light quilting it may not be the best model for more advanced designs. It also does not have a thread sensor. Q: Can you free-motion quilt on the computerized Brother HC 1850 machine? A: If you make the additional purchase for a free-motion quilting foot, you can. However, it is on the slower side as this machine doesn’t have a pivot function. Q: Does the machine handle thick fabric? A: Yes, only if needed occasionally and as long as you use the correct speed and tension. There are some reports that it is a little slow on thicker fabrics, but it is reported to work fine on upholstery with the right needle. Q: Does the machine have decorative stitches? A: Yes, it has 130 basic stitches and many of them are decorative. They aren’t specifically for embroidery, but they are lovely and easy to make on this machine. You have a convenient front panel with all the stitches and their numbers listed where you can see them. No need to open the manual. Q: Will the machine work for a complete beginner? A: Yes, it comes with a convenient instructional DVD. You can start at the absolute beginning. You can manually thread if you have to, although between the DVD and the manual you shouldn’t have too much trouble operating the self-threading mechanism. All in all, the machine is perfect for the home sewing setup. For intermediate to advanced quilters, the HC1850 is a great model that is used by lots of people with success, including some fashion students. The Brother HC1850 is equipped with a lot of speed and quiet functionality, and you should be able to log many happy hours sewing. This machine does free-motion quilt, so it’s a shoe-in for those who sew their clothes and for decorating as well as quilt. It is sturdy enough to handle properly threaded upholstery sewing as well as lighter projects, so consider it a great buy at the price point. If it seems too simple, you may need a more advanced machine, but it does the basics very well. It is a good choice both for those totally starting out sewing and for intermediate sewers. All in all, a great buy.